SunSkinz are tightly woven with proprietary high-density yarn. Four way stretch fabric is comfortable to wear, dries quickly and stands up well to chlorine and salt water. 100 SPF / UPF 50+ Maximum Broad Spectrum UV Protection Machine washable on delicate cycle or hand wash with a mild detergent. Hang dry out of the sun. Sun Protection That Doesn't Wash Off! Summer is almost upon us, and for our family it will mean tons of time spent outdoors! With many vacations planned and all of the time that we spend outside with the kids in our yard during the warmer seasons, I am starting to think about sun protection. We are always sure to slather on sunscreen, however, after a certain period of time has passed, or time spent in the water it's effectiveness can be questionable if not consistently reapplied. Both of my children have very sensitive skin, so this year they will be wearing some of their sun protection in the form of SunSkinz from Sun Protection Zone. 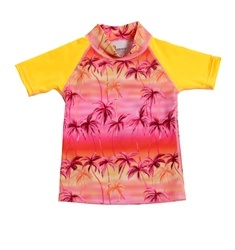 SunSkinz are lightweight short sleeve shirts that kids will enjoy wearing (made of a quick dry material-great for pairing with swimwear) that offer a 100 SPF / UPF 50+ protection from the sun. 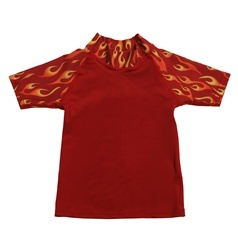 SunSkinz come in a variety of patterns and are available for both boys and girls in a wide range of sizes. The princess and B both received adorable patterns, that they are excited to wear (unlike when I try to apply sunscreen-they won't run from these adorable shirts!). We are ready to get out and have some fun in the sun this Summer (without sacrificing the health of our skin)! Fun in the Sun....Made Safe! One Lucky Reader will receive a SunSkinz in their choice of size & color! Leave a comment~ Which Sun Protection Zone product (other than the product featured) would you like to have for your little one this summer? The Comment is considered your entry. Entry to this giveaway ends at 12pm PST May 27, 2011. Winner's are chosen randomly through random.org.The winner will be announced in a post within 7 days of the giveaway ending, and contacted through email. The winner will have 48 hrs. to respond or another winner will be chosen. the boys solar wrapz looks great!